Planning to have a relaxing spa at home? After all the chores at home, piled up work in the office, we would end the day so exhausted. Then we experience the muscle pain and muscle inflammation. It is but right to ask our beloved behalf to give us a little massage right? Anyway, have you heard about this product shown above? These are Emu Oil, it has natural anti-inflammatory and healing properties with a wide range of omega oils that are known to facilitate good health. The oil derived from the emu offers a wide variety of therapeutic benefits. This oil is penetrating, anti-inflammatory, anti-bacterial, healing, moisturizing and non-comedogenic. Pure Emu Oil has been tested by the AOCS (American Oil Chemist Society) which is certified chemist and has been certified to meet the stringent specifications for the Emu Oil Fully Refined Trade Rules. This oil has the ability to reduce inflammation of the joints. It also contains high level of linolenic acid, a substance known to ease muscle ache and joint pain and oleic acid, which provide a local anti-inflammatory effect. 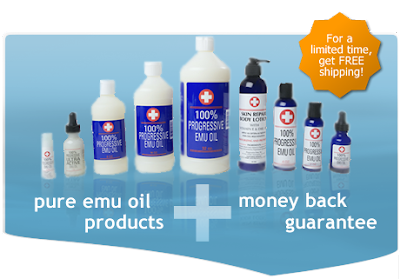 So, if you had these problems, make Emu Oil your constant companion to ease your pain away. Check the site now and see their products. Public Speaking : Are You Confident ?